To display the wave I am using XOSCILLO, a very cool and open source tool (which I wrote :P) that converts your Arduino into an oscilloscope. 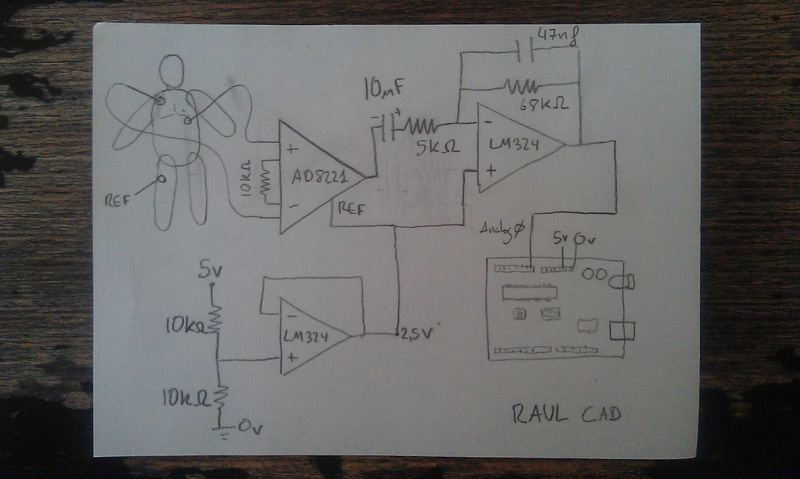 Here is the scheme, I am using the typical instrumental amplifier(ins amp) and then another op amp to get some more gain. An ins-amp is like an op-amps but with a huge CMRR, I am using a AD8221 which comes in a tiny small package, it's lead pitch is only 0.65mm, if you want to know what I did to create a simple breakout board please follow this link. I'm using a single supply for the amps that comes from the arduino 5V pin, and I am creating a buffered virtual ground, this is really important. Here is, a bit dark, a pic of the setup in the breadboard. The main problem is that the device is so sensitive that it get interference from almost everywhere, specially the mains hum at 50hz). As you can see I got a clean signal, and I am not using any kind of serious filtering, note that xoscillo has a low pass filter and I am not even using it, so what are the tricks? Run it from a laptop and unplug the charger! Buy some serious ECG electrodes, mines are "H124SG * Ø 24 mm", they come in a box of 50 and should cost about 11 euros. Hi, cool project. 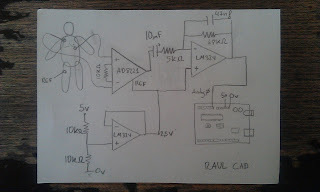 But I have a small remark to your schematic: As it's drawn, the 2nd OP does not add any gain at all. All the components around the LM324 in the upper right are completely insignificant compared to the impedance of the opamp inputs, it's just operating as a 1:1 voltage mirror (the leakage of the 10uF probably is likely enough so that there's no noticeable voltage shift). Also, instead of generating the 2.5V from the +5V supply voltage, you might be able to use the 1.1V stabilized reference of the ATMega on the analog reference pin (if you configure it right). It might be more stable than your Vcc supply (especially if you drive some additional loads). Will you please give full corrected figure? Doh! Good catch! Actually I made a mistake when I wrote down the circuit, thanks for pointing it out! I have just corrected it now. Good tip about using the 1.1V I'll give it a go. Can this be ported to run on a Raspberry Pi a computer/laptop isnt needed? The HDMI/Power issues will need resolving but a "TVcg" would be a powerful tool for "Doctors without Borders", etc. I am impressed my friend! Very clean signal. Props! Cool project. Good idea to state that you should unplug the charger - we don't want a physical connection to the power grid when not using medical grade equipment! are you having electrolyte imbalance issues? it appears your re-polarization phase is elongated. you might be calcium deficient. Thanks for the comments! This project ca be used with anything that has an ADC so a raspberry PI woudl be a good candidate too. TheVirus911, you mean the biphasic T wave? Yep I was told is technically abnormal and I may be getting a proper one to see what's up.. it could be that my ECG is distorting the signal somehow too.. thanks for pointing it out though! Nice rhythm, though you have a very pronounced T wave. Another cool project! Keep up the great work, I love reading this blog ! as I understand, there are two filters: first is the high pass filter for 3.18 Hz, and second is the low pass for 49.8 Hz. Am I right? If yes, the question is: why in high pass filter the resistor and capacitor are connected in serial whereas in low pass they are connected parallel? And why 3.18Hz for high pass filter? I am new to electronics and I just found your website -it is great! 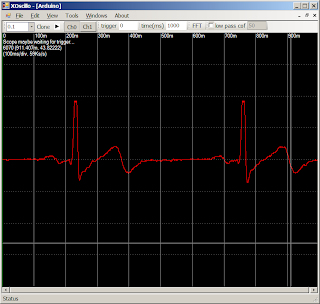 I have designed just like yours, I took ECG signal from an ECG simulator and used an Instrumentation amplifier AD620 ann filtered using low pass filter. Then I will convert the signal into a square wave by using an analog comparator. This wave will be provided to arduino uno R3 which count the beats (high) from the signal and displays heart rate per min on a LCD. 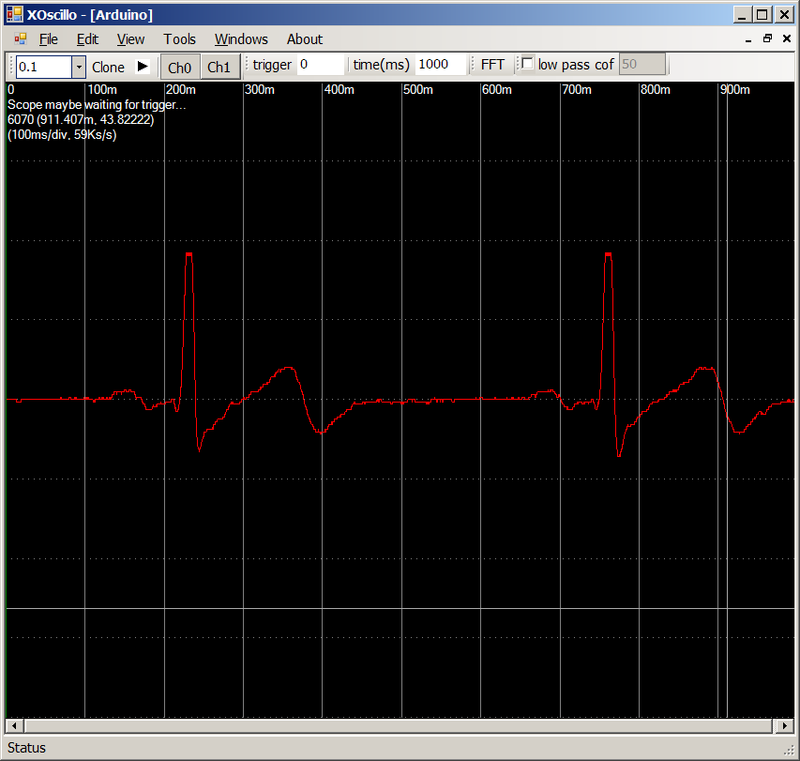 Now I want to display the ECG signal on my PC through Arduino, Plz help me in this regard.. Sorry for the delay. Did you unplug your laptop from the mains? It should be running on the batteries. Are you sure your circuit is running as intended? I'd try to lower the gain lets see what happens too. As for displaying the signal in oscillo you need to set the settings is xoscillo exactly as I did and you should see a curve. Use a low sampling rate that is the main thing. Hi Raul - this looks like a great project I want to try this weekend. Is the arduino source code availabe ? Hi, really cool project. I am trying to emulate your project and see what kind of output I get. Have you changed to circuit or values of the caps and resistors any further ? If so could you please update the new schematic or reply to this comment with details ? I would really appreciate it. Hi, really cool project. I was trying to emulate your project to see what kinda output I get but I couldn't get good results. I used the exact values for caps and resistors like you had in your schematic. I also used the exact same op amps and inst amps. Did you update the schematic any further ? I do not know what am I doing wrong. Will you please give final corrected circuit figure? thanks for this useful article,I,ll recommand it to my friends and I,ll be back again and again,Visit Our blog for more info. I just discovered this Minimal ECG project of yours. I have a question. 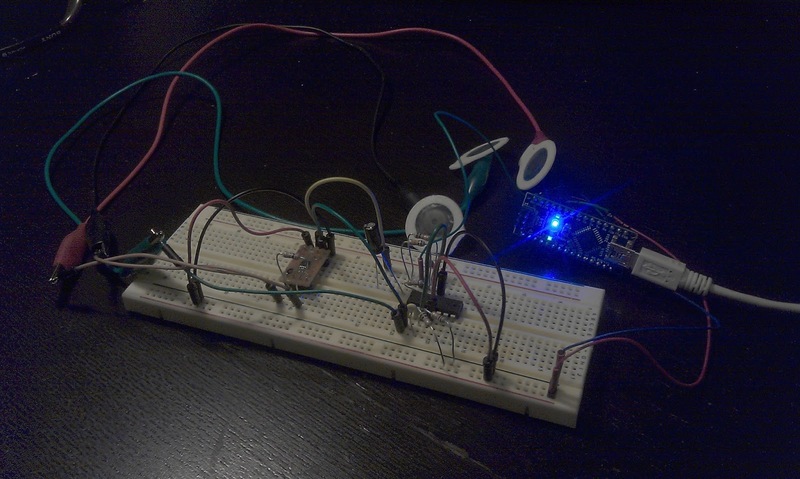 In the pics with breadboard there are three sensor pads. On the schematic I can see two pads from the chest connected to the inputs + and - of the AD8221. The question is where is the third pad maked on the body as "REF" connected to in the schematic? There is a "REF" marked in the schematic, but I am not sure if that is the same "REF" on the body that does not have a line to show where it connects on the schematic. could you send the code too? Is the reference electrode, which is the third electrode, attached to the leg and is this electrode attached to the reference electrode in the circuit? What if we put him in a coke?